Thurman SPEARS [Parents] was born on 22 Mar 1912 in , Haskell, Texas. He died on 26 Jul 1970 in Wright City, McCurtain, Oklahoma. Thurman married Rosetta "Etta". Rosetta "Etta" was born in 1911 in Valliant, McCurtain, Oklahoma. She died on 15 Apr 1990 in McCurtain Memorial Hospital, Idabel, McCurtain, Oklahoma. She was buried on 17 Apr 1990 in Old Wright Cemetery, Wright City, McCurtain, Oklahoma. Rosetta married Thurman SPEARS. M i Bobby Ray SPEARS was born on 28 Aug 1935. He died on 17 Oct 2004. Shirley Rose SPEARS was born on 26 Aug 1938 in Wright City, McCurtain, Oklahoma. He died on 20 Aug 1987 in McCurtain County Hospital, Idabel, McCurtain, Oklahoma. He was buried on 22 Aug 1987 in Old Wright Cemetery, Wright City, McCurtain, Oklahoma. M v William Columbus SPEARS. William Columbus SPEARS [Parents]. William married Esther Lorene WARD. Esther Lorene WARD. Esther married William Columbus SPEARS. Isaac OWENS was born in Jan 1905. Isaac married Tennessee Veeda SPEARS. Tennessee Veeda SPEARS [Parents] was born on 15 Feb 1909 in , , Arkansas. She died in , , California. Tennessee married Isaac OWENS. F i Marie OWENS was born on 17 Jul 1927. Thomas C. OWENS was born on 24 Nov 1897 in , , Oklahoma. He died on 20 Feb 1981 in Hoffman, Okmulgee, Oklahoma. He was buried in West Lawn Cemetery, Henryetta, Okmulgee, Oklahoma. Thomas married Della Virginia SPEARS on 16 May 1927. Della Virginia SPEARS [Parents] was born on 8 Nov 1912 in Oklahoma City, Oklahoma, Oklahoma. She died on 27 May 1988 in Hoffman, Okmulgee, Oklahoma. Della married Thomas C. OWENS on 16 May 1927. F i Lorene OWENS was born on 25 Feb 1932. Robert Lee OWENS was born on 17 Oct 1934 in , , Oklahoma. He died on 25 Nov 1948 in , Okmulgee, Oklahoma from Car wreck. He was buried in West Lawn Cemetery, Henryetta, Okmulgee, Oklahoma. F iii Helen OWENS was born on 1 Mar 1937. Clifford BAILEY. Clifford married Lorene OWENS. Lorene OWENS [Parents] was born on 25 Feb 1932. Lorene married Clifford BAILEY. Glen MARTIN. Glen married Helen OWENS. Helen OWENS [Parents] was born on 1 Mar 1937. Helen married Glen MARTIN. Theodore "Ted" SPEARS "I" [Parents] was born on 8 Jan 1919 in Haskell, Mc Intire, Oklahoma. He died on 13 Jul 1962 in Tulsa, Tulsa, Oklahoma. Theodore married Allie or Ollie Mae Kirkindall WATERS on 16 May 1945. Allie or Ollie Mae Kirkindall WATERS was born on 30 May 1921 in , McIntosh, Oklahoma. She died on 30 Jun 1994 in Sapulpa, Creek, Oklahoma. Allie married Theodore "Ted" SPEARS "I" on 16 May 1945. F i Marcella Sue SPEARS was born on 16 Nov 1945. M ii Dolpaha Theodore SPEARS "II" was born on 14 Feb 1947. F iii Quentella Ann SPEARS was born on 7 Oct 1949. F iv Genell SPEARS was born on 13 Dec 1950. F v Joyce SPEARS was born on 25 Jan 1954. John JONES. John married Joyce SPEARS on 4 Mar 1972. Joyce SPEARS [Parents] was born on 25 Jan 1954. Joyce married John JONES on 4 Mar 1972. George BRYER [Parents] was born on 12 May 1920 in Quay, Pawnee, Oklahoma. He died on 12 Mar 1986 in Cushing, Payne, Oklahoma. He was buried in Fairland Cemetery, Cushing, , Oklahoma. 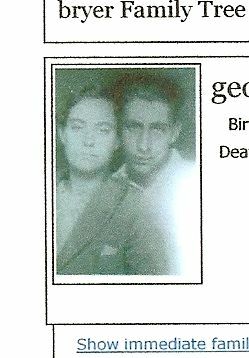 George married Dessie Della SPEARS on 20 Nov 1937. Dessie Della SPEARS [Parents] was born on 11 Oct 1920 in , , Oklahoma. She died on 30 Aug 1996 in Cushing, Payne, Oklahoma. She was buried in Cushing, Payne, Oklahoma. 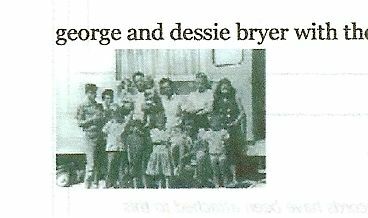 Dessie married George BRYER on 20 Nov 1937. M i Claud Delbert BRYER was born on 9 Jun 1939. Macey Francis BRYER was born on 26 Feb 1941. He died on 20 Mar 1942. Norman Earl BRYER was born on 13 Apr 1943. F iv Wanda Lee BRYER was born on 25 Apr 1945. M v Eugene James BRYER was born on 16 Oct 1947. F vi Linda Carol BRYER was born on 7 Mar 1950. M vii Easan Odell BRYER "Sr" was born on 7 Jan 1952. F viii Dessie Dellia BRYER was born on 26 Mar 1954. F ix Mamie Louise BRYER was born on 30 Nov 1956. George Allen BETHEA. George married Dessie Dellia BRYER on 4 Jul 1973. Dessie Dellia BRYER [Parents] was born on 26 Mar 1954. Dessie married George Allen BETHEA on 4 Jul 1973.